At the Ambassador Colleges... Education for LIFE! Key to Northwest European Origins is available in the Ambassador Library. [HWALibrary.com] The following is a list of books that Mr. McNair will quote from. You may find them helpful in future study. "O house of Jacob, come ye, and let us walk in the light of the LORD." "In that day shall the branch of the LORD be beautiful and glorious, and the fruit of the earth shall be excellent and comely for them that are escaped of Israel." "And it shall come to pass in that day, that the remnant of Israel, and such as are escaped of the house of Jacob, shall no more again stay upon him that smote them; but shall stay upon the LORD, the Holy One of Israel in truth. The remnant shall return, even the remnant of Jacob, unto the mighty God. For though thy people Israel be as the sand of the sea, yet a remnant of them shall return: the consumption decreed shall overflow with righteousness." "And it shall come to pass in that day, that the Lord shall set his hand again the second time to recover the remnant of his people, which shall be left, from Assyria, and from Egypt, and from Pathros, and from Cush, and from Elam, and from Shinar, and from Hamath, and from the islands of the sea." "Cry out and shout, thou inhabitant of Zion: for great is the Holy One of Israel in the midst of thee." "For the LORD will have mercy on Jacob, and will yet choose Israel, and set them in their own land: and the strangers shall be joined with them, and they shall cleave to the house of Jacob." God will break the Assyrian yoke off Israel. God will bless Assyria, Egypt, and "Israel mine inheritance." "Then the moon shall be confounded, and the sun ashamed, when the LORD of hosts shall reign in mount Zion, and in Jerusalem, and before his ancients gloriously." "And he will destroy in this mountain the face of the covering cast over all people, and the veil that is over all nations." "And it shall come to pass in that day, that the Lord shall beat off from the channel of the river unto the stream of Egypt, and ye shall be gathered one by one, O ye children of Israel. And it shall come to pass in that day, that the great trumpet shall be blown, and they shall come which were ready to perish in the land of Assyria, and the outcasts in the land of Egypt, and shall worship the LORD in the holy mount at Jerusalem." "But they also have erred through wine, and through strong drink are out of the way; the priest and the prophet have erred through strong drink, they are swallowed up of wine, they are out of the way through strong drink; they err in vision, they stumble in judgement." "Is it not yet a very little while, and Lebanon shall be turned into a fruitful field, and the fruitful field shall be esteemed as a forest? And in that day shall the deaf hear the words of the book, and the eyes of the blind shall see out of obscurity, and out of darkness." They also that erred in spirit shall come to understanding, and they that murmured shall learn doctrine." "For the people shall dwell in Zion at Jerusalem: thou shalt weep no more: he will be very gracious unto thee at the voice of thy cry; when he shall hear it, he will answer thee." "For thus hath the LORD spoken unto me, Like as the lion and the young lion roaring on his prey, when a multitude of shepherds Is called forth against him, he will not be afraid of their voice, nor abase himself for the noise of them: so shall the LORD of hosts come down to fight for mount Zion, and for the hill thereof." "Then shall the Assyrian fall with the sword, not of a mighty man; and the sword, not of a mean man, shall devour him: but he shall flee from the sword, and his young men shall be discomfited." "Behold, a king shall reign in righteousness, and princes shall rule in judgement.... And the eyes of them that see shall not be dim, and the ears of them that hear shall hearken." "And my people shall dwell in a peaceable habitation, are sure dwellings, and in quiet resting places." "The LORD is exalted; for he dwelleth on high: he hath filled Zion with judgement and righteousness. And wisdom and knowledge shall be the stability of thy times, and strength of salvation: the fear of the LORD is his treasure." "Look upon Zion, the city of our solemnities: thine eyes shall see Jerusalem a quiet habitation, a tabernacle shall not be taken down; not one of the stakes thereof ever be removed, neither shall any of the cords thereof be broken." "For the LORD is our judge, the LORD is our lawgiver, the LORD is our king; he will save us." "The wilderness and the solitary place shall be glad for them; and the desert shall rejoice, and blossom as the rose. It shall blossom abundantly, and rejoice even with joy and singing: the glory of Lebanon shall be given unto it, the excellency of Carmel and Sharon, they shall see the glory of the LORD, and the excellency of our God. Strengthen ye the weak hands, and confirm the feeble knees. Say to them that are of a fearful heart, Be strong, fear not: behold, you God will come with vengeance, even God with a recompence; he will come and save you." "But thou, Israel, art my servant, Jacob whom I have chosen, the seed of Abraham my friend... I will plant in the wilderness the cedar, the shittah tree, and the myrtle, and the oil tree; I will set in the desert the fir tree, and the pine, and the box tree together." "Fear not: for I am with thee: I will bring thy seed from the east, and gather thee from the west. I will say to the north, Give up; and to the south, Keep not back: bring my sons from far, and my daughters from the ends of the earth.... Ye are my witnesses, saith the LORD, and my servant whom I have chosen: that ye may know and believe me, and understand that I am he: before me there was no God formed, neither shall there be after me.... I am the Lord, your Holy One, the creator of Israel, your King." "This people have I formed for myself; they shall shew forth my praise." "But Israel shall be saved in the LORD with an everlasting salvation: ye shall not be ashamed nor confounded world without end." "Come down, and sit in the dust, O virgin daughter of Babylon, sit on the ground: there is no throne, O daughter of the Chaldeans: for thou shalt no more be called tender and delicate.... I was wroth with my people, I have polluted mine inheritance, and given them into thine hand: thou didst shew them no mercy; upon the ancient has thou very heavily laid thy yoke." "Behold, I have refined thee [Israel], but not with silver I have chosen thee in the furnace of affliction." "Listen, O isles, unto me; and hearken, ye people, from far: The LORD hath called me [Israel] from the womb; from the bowels of my mother hath he made mention of my name". "And said unto me, Thou art my servant, O Israel, in whom I will be glorified." "Thus saith the Lord GOD, Behold, I will lift up mine hand to the Gentiles, and set up my standard to the people: and they shall bring thy sons in their arms, and thy daughters shall be carried upon their shoulders. And kings shall be thy nursing fathers, and their queens thy nursing mothers: they shall bow down to thee with their face toward the earth, and lick up the dust of thy feet; and thou shalt know that I am the LORD: for they shall not be ashamed that wait for me." "Look unto Abraham your father, and unto Sarah that bare you: for I called him alone, and blessed him, and increased him. For the LORD shall comfort Zion: he will comfort all her waste places; and he will make her wilderness like Eden, and her desert like the garden of the LORD; joy and gladness shall be found therein, thanksgiving, and the voice of melody." "Awake, awake; put on thy strength, O Zion; put on thy beautiful garments, O Jerusalem, the holy city: for henceforth there shall no more come into thee the uncircumcised and the unclean. Shake thyself from the dust; arise, and sit down, O Jerusalem: loose thyself from' the bands of thy neck, O captive daughter of Zion." "Israel's husband will deal mercifully with Israel: "No weapon that is formed against thee shall prosper; and every tongue that shall rise against thee in judgement thou shalt condemn. This is the heritage of the servants of the LORD, and their righteousness is of me, saith the LORD." "The Lord GOD which gathered the outcasts of Israel saith Yet will I gather others to him, beside those that are gathered unto him." 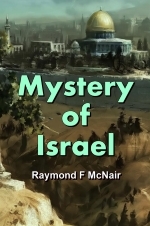 "Israel will receive the "forces" and wealth of the Gentiles. "And they shall build the old wastes, they shall raise up the former desolations, and they shall repair the waste cities, the desolations of many generations. And strangers shall stand and feed your flocks, and the sons of the alien shall be your plowmen and your vinedressers." "God will rejoice over and bless Israel and Jerusalem." "Rejoice ye with Jerusalem, and be glad with her, all ye that love her: rejoice for joy with her, and ye that mourn for her." "And they shall bring all your brethren for an offering unto the LORD out of all nations upon horses, and in chariots, and in litters, and upon mules, and upon swift beasts, to my holy mountain Jerusalem, saith the LORD, as the children of Israel bring an offering in a clean vessel into the house of the LORD.... And it shall come to pass, that from one new moon to another, and from one sabbath to another, shall all flesh come to worship before me, saith the LORD."